Ride Along, the hit film starring Kevin Hart and Ice Cube. has topped box office charts for its opening weekend. The film came in at $41.2 million out doing the other new release Jack Ryan: Shadow Recruit by $24 million. 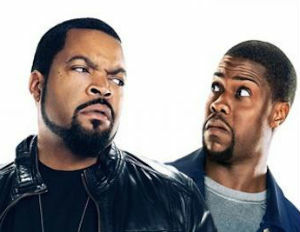 “Ride Along,â€ which was produced by Ice Cube, did better than industry predictions of $28 million. In fact, it had the biggest three-day MLK holiday weekend opening ever. Despite the box office win, the reviews haven’t been kind to the film. Only 10 of 47 reviews were favorable, according to the site Rotten Tomatoes. People don’t seem to care. Ninety-four percent of the audience polled on the movie review site wanted to see it. “The timing was really right on this one,â€ said Nikki Rocco, president for domestic distribution at Universal Pictures which released the film. The budget for the movie was about $25 million.